There are more websites than ever that offer free music online, so it can understandably be a little daunting to know where to look first and which free music services are the best. That's why we've made it easy and reviewed the best places to listen to free music so that you can just pick one and get started. These free online music sources all work a little bit differently and have many different features. You'll basically find music databases where you can search for an artist or song and listen to it on-demand, or there might be online radio stations which work more fluidly. They all have their own bells and whistles giving you just what you want. 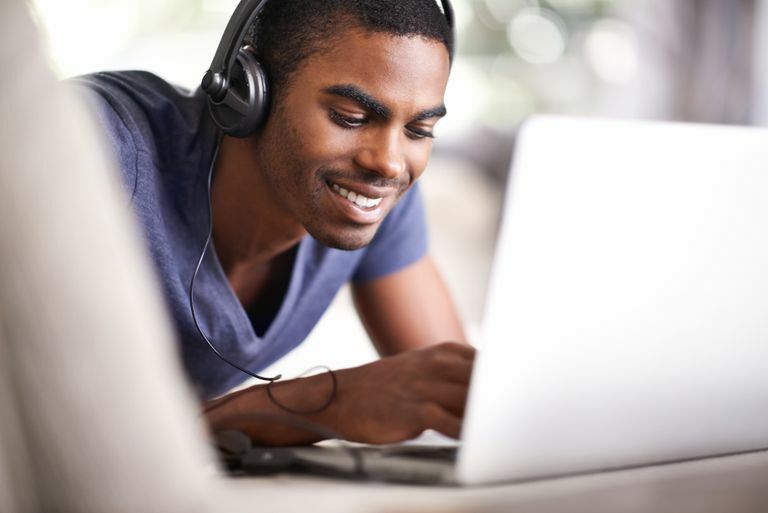 Although these websites are all great places to listen to free music online, many are ad-based, so you'll need to listen to commercials every once in awhile. There are also sometimes rules on how often you can skip songs within a playlist or radio station. Be sure to read each website's FAQs to find out all the details. These websites offer free music online but if you want to keep the music you hear, you'll want to find out where you can download free music. You also might like to know where the best places online are to watch free music videos, plus which music apps are the best. Spotify is an awesome free music streaming website with millions of songs available for you to listen to whenever you want and as many times as you want. Spotify acts as a radio, which means you'll hear songs from artists you've heard of and want to listen to. The free music online through Spotify is played through a web browser, mobile device, or desktop manager that you can download to your computer. Once you're up and going you can search and listen to your favorite music, create playlists, and share the music you love with all your friends. You can even access other people's handmade playlists, like this Indie Chillout playlist. The premium plan is available, which lets you download Spotify music, listen without ads, stream HQ music, play any song you want any time you want, and skip songs as often as you like. You can get it free for 30 days before payments kick in. Google Play Music is one of the fastest-growing places to listen to free music online. They have a giant library of music and you can listen to your favorites by searching for them or visiting the top charts or new releases. Most are free to listen to with the occasional ad, but some can only be used to start a radio. With radio stations, you can browse for ones based on certain genres, decades, activities, or moods, and a whole category meant just for kids. Google Play Music also has podcasts and lets you upload your own music to listen from anywhere. You can get a paid subscription to Google Play to get rid of those ads and remove restrictions put on the free plan. There's also a family plan for six people. Both are free for the first 30 days. Enter an artist, genre, or composer into Pandora and they'll create an online streaming radio station based on what you like. As you listen to your radio station you'll hear songs and artists that are similar to ones you already like. You'll then be able to tell Pandora if you want to hear more like what you're listening to or move in a different direction. You're not limited to the free online music of one radio station either — you can create up to 100 unique stations that only contain music that you love. If you're not sure where to start, try Top Stations or jump right into any specific genre. Besides listening to free music online that Pandora offers, you can also download a free Pandora app for your mobile device. Pandora Premium and Pandora Plus are the ad-free, paid versions of Pandora that include features like a desktop program, higher audio quality, offline listening, and more. You can also get Pandora Premium Family for six people. iHeartRadio combines a live radio app and a custom music streaming service into one awesome website and app. You can listen to live radio stations by choosing the city and genre that you like, and iHeartRadio will display all the stations that match your search criteria, after which you can begin listening immediately. If you'd rather not listen to the radio, you can build your own custom stations that's like a radio station but is instead built around the songs and artists you already know you like. This works by telling iHeartRadio what you want to listen to, and it will play songs similar to the ones you define. The iHeartRadio mobile app supports a sleep timer so you can listen to music as you fall asleep, as well as an alarm to automatically begin playing any of your favorite stations in the morning. To play specific songs, replay music from the radio, listen offline, build an unlimited number of playlists, skip more songs, etc., you have to pay for Plus or All Access. Slacker Radio is similar to some of these other music streaming websites in that it lets you create custom radio stations that are built around the songs, genres, and artists that you enjoy. After choosing the type of music you like to listen to, Slacker Radio will stream similar music mixed in with the songs you suggested. Slacker Radio also works from various mobile devices through their free app. You can buy a subscription to Slacker Radio for features such as no ads, offline playback, or the option to play music on demand. TuneIn is probably the best place to listen to live radio stations over the internet. It's dead simple to find the stations local to your area but also ones from anywhere else on the globe — there are 100,000+ stations! Radio stations can also be browsed by music, sports, news, and talk genre so you can find anything from rock, ambient, and religious music to tennis stations, business news, and travel radio stations. A good place to start is with the trending radio stations so you can see what most of the other TuneIn users are listening to right now. This music streaming site also hosts podcasts. TuneIn works from a web browser or desktop program on a computer, as well as through mobile apps. You can store your favorite stations in your account to have access to them on all your devices. For more features like no ads or commercials, you can upgrade to TuneIn Premium, which includes 30 days free. SoundCloud works by users and artists uploading music for you to freely listen to, so there's both up-and-coming and homemade audio that you can find here. You're able to explore the site through genre like Disco, Electronic, Country, and Ambient, among others, as well as by what's trending. There's also a search tool so you can quickly find artists, tracks, bands, and even podcasts. Following users lets you stay on top of their new releases, and you can like tracks and playlists to store them in your personal music collection. Free SoundCloud mobile apps are also available with SoundCloud. SoundCloud Go lets you listen without an internet connection, removes ads, and gives you access to premium tracks. It has a free 30-day trial available. Deezer is a slick music streaming website with lots of genres to choose from, plus radio stations, and fun pre-made mixes. Play individual songs or whole collections at once, add music to your own custom playlists that you can play back and share with others, and easily access all the most popular songs on Deezer on one page. The Hear This page is full of recommended music based on your listening habits. This is the best way to discover new music on Deezer. Apps for listening to Deezer music are available for your computer and mobile device, and other places like in your car. Deezer Premium is free for 30 days and lets you listen to any track you want with no ads, plus you get offline access to your music and high-quality streams. Other subscriptions include Deezer HiFi and Deezer Family. Dash Radio is another internet radio website where you can stream free music. It has dozens of stations in lots of different genres. Find a station by genre or through the search to start streaming music immediately. You can add any station to your dashboard for easy access in the future, and you can share them with others over social media websites and email. Apps for Dash Radio are available for Android, iOS, and Amazon devices. It also works with Google Home and other devices. The free online music at 8tracks is grouped into playlists that are put together by you or by another 8tracks listener. Some examples include happy, feel good, chill, love, summer, dance, sad, and study. It's a fun way you can become your own DJ or appreciate that someone else took the time to create the perfect mix for whatever mood you're in. You can even combine multiple searches into one to find unique playlists. Free apps for iPhone, Android, BlackBerry, and other devices are available for 8tracks. To remove ads and get unlimited listening, you'll have to pay for 8tracks Plus. There's a 14-day trial before you're charged. Myspace used to be a really popular social networking site, but it's been remade into a music platform. You can hear songs you know and discover new tracks, and you don't even need a Myspace account to do it. You can find music on Myspace by searching for the artist or song name, but there are also many genres to choose from and a section for mixes such as Top Country Songs on Myspace, Top Pop Songs on Myspace, and others for alternative indie songs, rock music, best songs by year, and more. Jango is another free streaming radio station and they make it super easy to listen to free music online from your computer, phone, or tablet. You'll be creating your own custom radio station based on artists that you like and what you think of similar artists. The aspect that makes Jango unique is that you can listen to other user's radio stations and they can listen to yours. Visit the Trending station to jump right into the most popular radio stations, or pick from any of the genres listed on the home page. Another source of unlimited free music is MusixHub. This website works by connecting the albums you want to the music videos of those songs on YouTube. The cool thing is that you never leave the MusixHub website. Once you find the right album you want, all the songs are listed on the side of the page and you can pick which ones to listen to. You can search or browse for artists even without having a user account with MusixHub or YouTube. However, if you log on to your Facebook account, you can save the albums and artists you love to a private library. Some of the genres you'll find at MusixHub include electronic, punk, dance, new wave, alternative, rock, pop, and rap. AccuRadio is like some of the other online radios in this list. You can browse for a station by genre or have AccuRadio pick a random one for you if you're not sure what you want to listen to. Or, maybe you want to listen to the most popular music they have. You can sign up for a free user account with AccuRadio to hear fewer commercials, customize your channel to better suit your tastes, and save channels as favorites. However, if you use AccuRadio on certain days, according to this schedule, you can listen to music with zero commercials! There's also a handful of AccuRadio mobile apps so that you can listen on other devices. Mixcloud is a unique place to get free music online, asking you to "re-think radio." All the music here is put together by DJ's and radio presenters from around the world, making for a different listening experience than what you may be used to. You can sort these mixes, radio shows, and music podcasts by mood or genre as well as searchable tags. There are Mixcloud apps available for iPhone/iPad and Android if you'd rather listen on your phone or tablet. It's also available for Apple TV. For more features like zero ads and early access to new features, you might consider getting Mixcloud Premium or Pro. StreamSquid is another free music streaming service you can start using right now without even making a user account. What makes this website different than the ones above is that it lets you play YouTube songs without seeing the videos. You get to stream all your favorite YouTube music by searching for the artist or song title. StreamSquid also includes its own music collection and has several ways to help you find your new favorite songs. It's easy to see the popular music here because there's a dedicated Popular page, but beyond that, you can search for specific tracks, albums, and artists, and browse the editor's picks, top charts from various countries, new releases, genres, and more. You can listen from your computer or through the StreamSquid Android app.